how many pull ups are in a packet? There are 14 pull ups per packet. I am looking for pull ups for a size 18 lady, would large be the best fit? The average UK size 18 waist is around 40". Our Large pull up waist measurements are 31.5- 47.2" so should fit fine. The other measurements for this product that might be helpful are: Crotch width- 22cm. Pad length- 64cm. I would suggest comparing her measurements to these, if you are unsure. 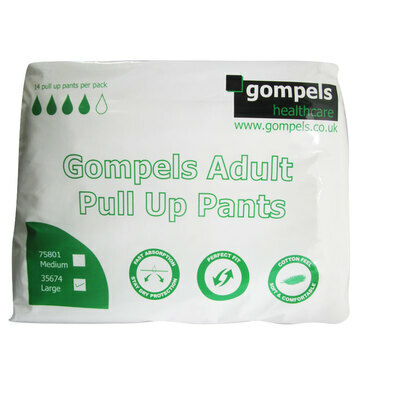 Maintain the dignity and comfort of every single one of your patients with our Gompels Adult Pull Up pants. Designed for maximum comfort, each cotton soft pair has been anatomically shaped for the most cushioned posterior fit while the light weight structure offers exceptional discretion when worn under clothes. Super absorbent powder contained inside draws moisture and liquids away from the skin and locks them down to prevent discomfort. These pull up pants features a blue striped front waistband and can be easily removed by tearing the side seams. Haigh Macerator approved, we provide these pull ups in a range of sizes and absorbency levels to suit your homes needs. We also stock our Pull Ups in a Medium size for smaller adults.